In my first entry, I wrote that the main motivation to start this blog which I have been planning for a long time came from Forum for the Future‘s new strategy about system innovation. Last week they have released a short animation announcing this new strategic move and explaining what system innovation is. I found the animation to be concise, clear and to the point. Of course, whenever a complex topic is simplified for the sake of making it easy to understand, there is selective elimination of certain aspects of the topic which make it complex (and which generally constitute the essence of the topic). But for this very reason, I think the animation is very effective. The main messages given in the animation are completely aligned with those messages us ranty academics have been trying to get through to the public, businesses and governments for a long time. The difference is, we write pages and pages long of reports, journal articles, books etc which none of these stakeholders can be bothered to read (even if they would bother and even if they had time, most often than not they don’t have access to the material) and these guys come up with a short animation which is fun to watch and not full of perplexing scientific jargon. Another important determinant of effective communication is of course the timeliness of the message. Governments, organisations and individuals are starting to realise that the sustainability issues are far more complex than we once thought them to be and there is definitely a need to move beyond single-issue-focused optimisation approaches. I’d like to share this animation here for two reasons. First, simply because I’d like to spread it so that more people will hear about system innovation. Second, using it as an inspiring spark for me, I’d like to ask some questions I have in my mind about how best to approach system innovation (which I’ll leave to my upcoming entries). 4. To achieve system innovation, measurement and analysis, futures thinking and futures inquiry tools, and, creativity and innovation tools are needed (my addition: this corresponds to the three types of knowledge needed for systemic interventions: 1. Systems knowledge; 2. Target knowledge, and; 3. Tranformation knowledge (Wiek, Binder & Scholz, 2006)). 5. FFF proposes to start their system innovation adventure focusing on three sectors: food, energy and finance. Wiek, A., Binder, C., & Scholz, R. W. (2006). Functions of scenarios in transition processes. Futures, 38(7), 740-766. Starting a blog about system innovation for sustainability has been on my agenda since I finally finished my PhD in December 2010. But life has taken over and I got busy with lecturing and carrying on with research. The motivation to finally start this blog has come from Forum for the Future (a UK-bsed charitable organisation which works with business and government to create a sustainable future) launching its new strategy a couple of days ago. This is a sign that finally system innovation is becoming a topic of agenda for those other than us academics. This means that there’ll be more talk and walk about it, that finally politicians, company reps and even our neighbours will hear about it, and that there’ll be some exciting action and discussion among self-organising sustainability-enthusiast communities towards taking part in achieveing system innovation. Well, maybe not that fast… But I see FFF’s new strategy as a big step towards a higher-level understanding of what sustainability is, and how it can be achieved by the society. My aim to start the blog is to share my (past and hopefully future) learnings and insights about system innovation with those interested and to learn from them hoping that this blog will enable enlarging my network which is currently limited to the academics working in this area. 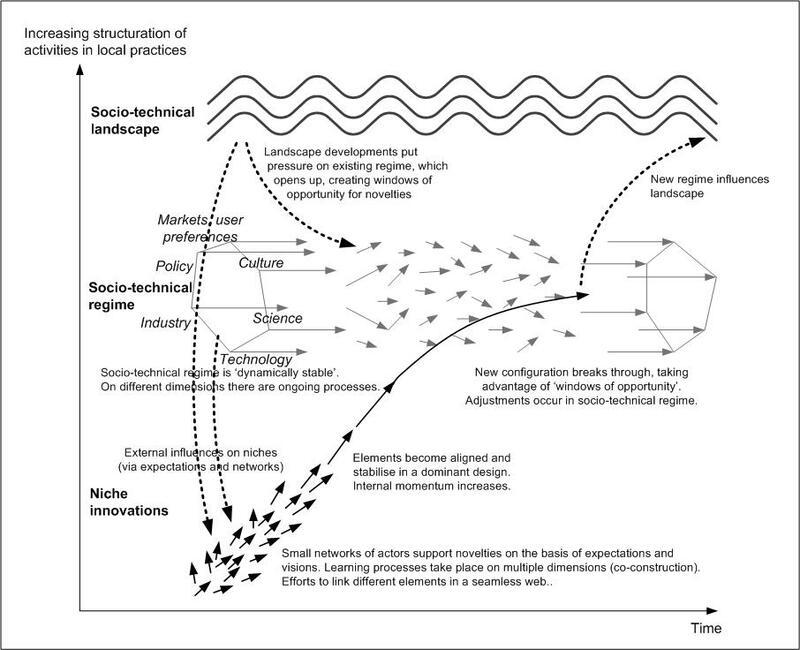 My interest in system innovation, as much as being driven by my academic research agenda, also stems from a deep and very human desire to influence change towards co-creating a sustainable and desirable future. So, yay!